The ADRC participated in the 4th meeting of the Working-Group on Disaster Prevention and Preparedness which was jointly organized by United Nations Economic and Social Commission for Asia and the Pacific (UNESCAP), the World Meteorological Organization (WMO) Typhoon Committee Secretariat, and the National Emergency Management Agency of the Republic of Korea in Seoul on 8-29 April 2009. 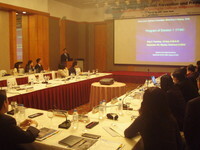 The 22 participants who attended the meeting included representatives from China, Japan, Lao People's Democratic Republic, Malaysia, Philippines, Republic of Korea, Thailand, USA, Viet Nam, Hong Kong and Macao Special Administrative Regions, as well as representatives from the three organizing institutions. During the meeting, participants discussed future activities of the working group, such as upgrade of the Typhoon Committee Disaster Information System (TCDIS), which is expected to be a useful typhoon- related disaster database for Asia. The ADRC gave a presentation on the role of GLIDE numbers, which are to be assigned to disasters contained in the individual databases of different organizations, and on the ADRC's contributions to the working group this year. The next meeting scheduled is the Integrated Workshop of the Typhoon Committee, to be held in the third week of September in the Philippines. The Typhoon Committee has two other working groups on meteorology and hydrology, in addition to the working group on disaster prevention and preparedness.